Re: ቁርጠኛ አማራ ነዎት? ከሆኑ አሥራት አማራ ሚዲያን ይደግፉ!!!! $36,295 raised!!! ESAT is the true voice, ears, and eyes of the Amhara. 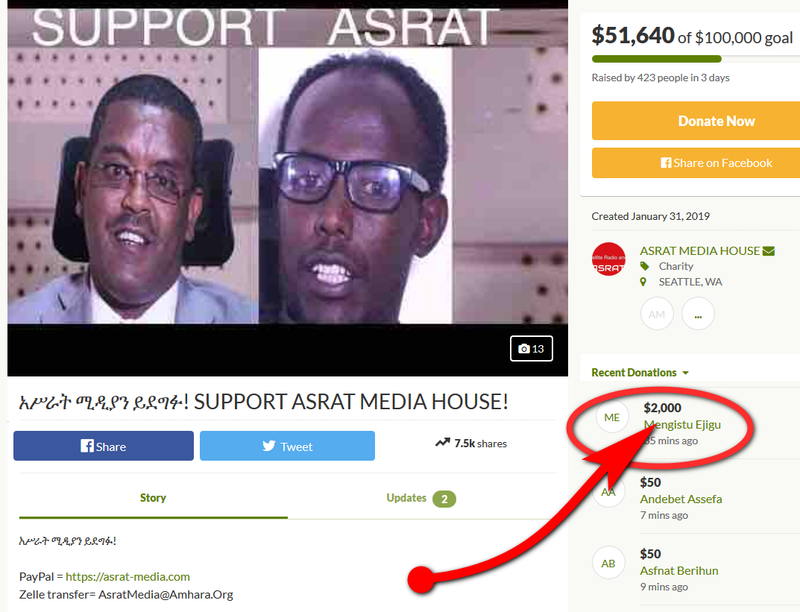 Please donate to ESAT, the reputable and respected voice of the Amhara and Gurage. Re: ቁርጠኛ አማራ ነዎት? ከሆኑ አሥራት አማራ ሚዲያን ይደግፉ!!!! በ2 ቀናት ውስጥ $38,142 raised!!! በ2 ቀን ውስጥ ለአስራት የአማራ ሚዲያ የሚሆን $38,142 ብር በGofundme ተለግሷል!!! ከ"ጎ ፈንድ ሚ"ው በተጨማሪ አካውንት ለጠየቃችሁ ወገኖች! ይህ አሜሪካን ሀገር በኮሚቴው የተከፈተ አካውንት ነው። በዚህ በኩል ማገዝ ትችላላችሁ! በ2 ቀናት ውስጥ $40,572 raised!!! በ2 ቀን ውስጥ ለአስራት የአማራ ሚዲያ የሚሆን $40,572 ብር በGofundme ተለግሷል!!! Last edited by Maxi on 03 Feb 2019, 19:04, edited 3 times in total. Tigres are our Ethiopian brothers and sisters and I don’t see why you think others will be concerned if the region is successful. The success of one region is the success of others. I know you feel uncomfortable when you hear such views. So does Satan. KIFU! You're a lice-infested dumbass of the worst order. One Ethiopian region’s success, is a success for the others. We are all in this together and we fall or rise as one nation. Unless you’re a tumor (which I think you are as a woyane rat) you do not grow or shrink alone. Which of your finger does that? KINIKINAM, KIFU! Re: ቁርጠኛ አማራ ነዎት? ከሆኑ አሥራት አማራ ሚዲያን ይደግፉ!!!! በ2 ቀናት ውስጥ $40,572 raised!!! i cant talk in circle. yes, one region success is everyone success but what i am saying is to duplicate this success one should start industrial park, create job and attract investors not create 100 newspaper ... i am saying if Amhara want to be successful like the golden then they have to work hard like golden to do that they stop wasting their money on beer, and useless ESAT , AG7 AND SO ON..
WTF - you’re the one trapped in a vicious circle and rat hole of hatred, KINKIN and KIFAT. Your woyane JELLO antenna goes up whenever you hear of good things in other Ethiopian regions. It is none of your business if people want to contribute to an Amhara or Oromo cause. KIFU! Re: ቁርጠኛ አማራ ነዎት? ከሆኑ አሥራት አማራ ሚዲያን ይደግፉ!!!! Good for you but I am not sending a penny. በጠዋቱ ጮማ የሆነ ዜና አለኝ! "ስማቸው እንዲጠቀስ የማይፈልጉ 3 ታላላቅ የአማራ ባለሀብቶች ለአስራት ሚዲያ ማቋቋሚያ 1 ሚሊዬን ብር(ወደ 35,000 ዶላር ገደማ) እንደሚረዱ ቃል ገብተዋ። በጣም እናመሰግናለን!!! ለአሥራት አማራ ሚዲያን ማቋቋሚያ የሚሆነ $20,660 of $100,000 goal መሰብሰብ ችለናል!! አማራዎች በርቱ ከግባችን ለመደረስ ብዙ ይቀረናል!!! የለገሳችሁትን አማራ ወገኖች እንደ እንድ አማራ ላመሰግናችሁ እወዳለሁ!! It amazes me the Amharas who are living in North America their wishing to be the spokespersons of the Amharas in Ethiopia. There are thousands of college educated Amharas in Ethiopia, but not in North America. Re: ቁርጠኛ አማራ ነዎት? ከሆኑ አሥራት አማራ ሚዲያን ይደግፉ!!!! በ3 ቀናት ውስጥ $51,510 raised!!! በ2 ቀን ውስጥ ለአስራት የአማራ ሚዲያ የሚሆን $51,510 ብር በGofundme ተለግሷል!!! Revelations pls ignore this guy and lets celebrate our Success!! None of your freakin businesses whom I support and don’t. KINIKINAM woyane. Re: ቁርጠኛ አማራ ነዎት? ከሆኑ አሥራት አማራ ሚዲያን ይደግፉ!!!! በ3 ቀናት ውስጥ $53,150 raised!!! በ3 ቀን ውስጥ ለአስራት የአማራ ሚዲያ የሚሆን $53,150 ብር በGofundme ተለግሷል!!! ለአሥራት የአማራ ሚዲያ ለለገሳችሁት አማራዎች እናመሰግናለን! !